Energy Gel is smooth with a light consistency, making it easy to have on the go. And, because it’s made with natural fruit juice, it tastes great too! Easy to open and swallow, each sachet delivers 23g of carbohydrate energy. Energy Gel is designed to be taken BEFORE and DURING exercise. Please consider the environment and keep the countryside clean by taking your empty gel wrappers with you after use. 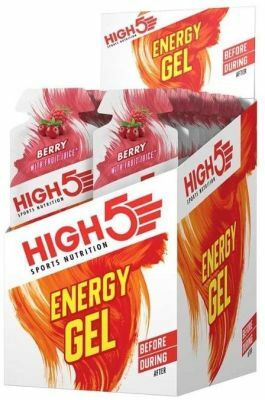 Which HIGH5 gel to choose: Energy Gel or Energy Gel Aqua? There is no right or wrong answer: they both do the same job; it’s simply down to personal preference. Energy Gel Aqua has a lighter consistency – somewhere between a drink and a gel. Whereas Energy Gel is less bulky and lighter in weight, which makes it easier to carry in larger quantities. As part of our Drugs Free policy, we provide products that have been batch tested. If you require products from a batch that has been tested for substances on the WADA Prohibited List, then please select the “Batch Tested” option in the flavours menu. This will be shipped with a certificate from our accredited lab. Please note that we do not use banned ingredients and have never had a failed test.